In the US, Mother’s Day is Sunday, May 12th. 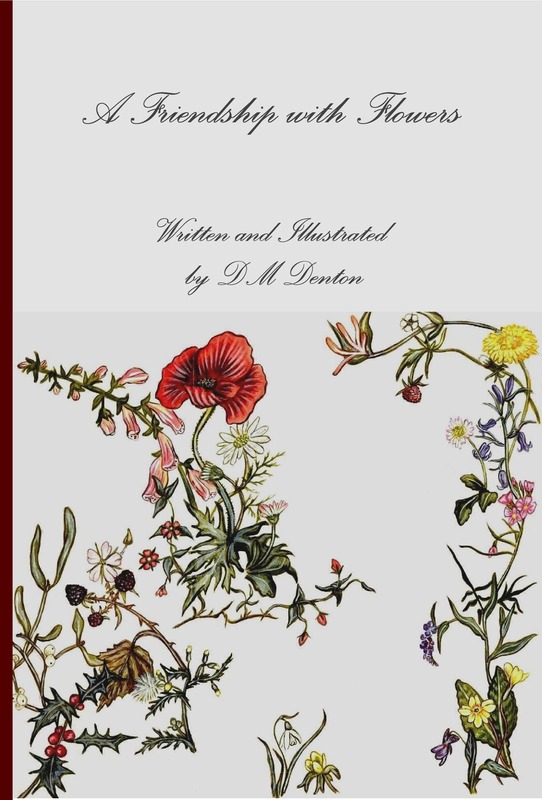 This book of my reflections and illustrations on flowers could be an everlasting bouquet to give to your mother, wife, sister, daughter, girl friend, or any woman who is special in your life. 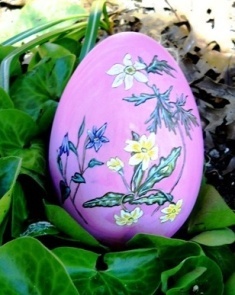 It would make a perfect gift for any occasion for anyone who appreciates the beauty, wisdom and playfulness of flowers! It is now available at amazon.com with free shipping. You can also preview more pages there. It can also be purchased and previewed at lulu.com. 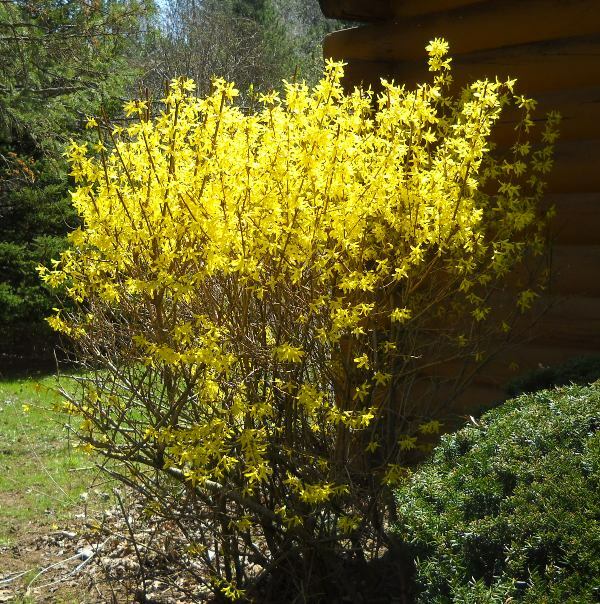 Here is a photo of one of the forsythia bushes in my yard, taken just this morning, a glorious spring day! 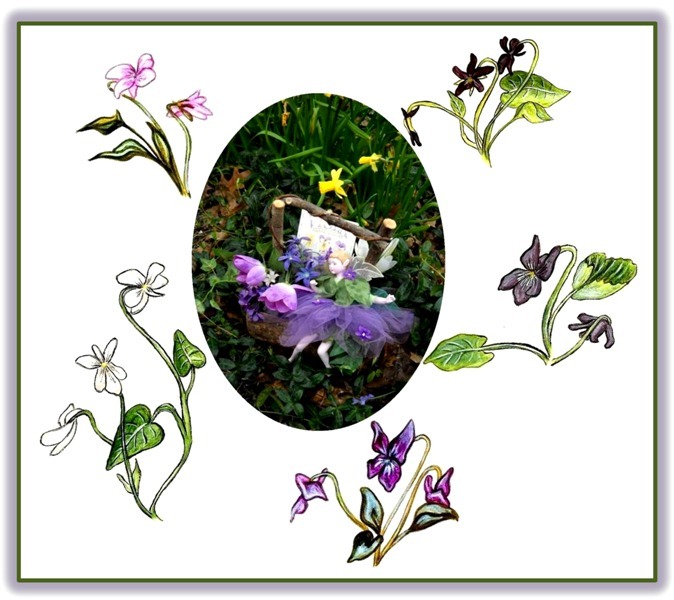 Writer’s note: The violet/spring fairy in the center image at the top of the poem is one I have left from a series I made in the early 90’s. Writer’s apology: To the blogs I follow – please accept my apologies for being behind on your posts. I just started a new ‘day’ job and am on the last stretch of the sequel I am writing to my novel, A House Near Luccoli (for which marketing endeavors take up a lot of my time, too). I know I am missing some wonderful writing, artwork, photography, and more, and hope to catch up as I can. Blessings to all. A House Near Luccoli focuses on chance encounters, beautiful music, and the paradox of genius through an imagined intimacy with one of the most legendary and undervalued figures of Italian Baroque music. in Paperback, Kindle, and NOOK Book editions. Soon to be released as an audio book! Over three years since the charismatic composer, violinist and singer Alessandro Stradella (1639 – 1682) sought refuge in the palaces and twisted alleys of Genoa, royally welcomed despite the alleged scandals and even crimes that forced him to flee from Rome, Venice, and Turin, his professional and personal life have begun to unravel again. He is offered, by the very man he is rumored to have wronged, a respectable if slightly shabby apartment and yet another chance to redeem his character and career. He moves in to the curiosity and consternation of his caretakers, also tenants, three women whose reputations are of concern only to themselves. Donatella, still unmarried in her mid-thirties, is plainly irrelevant. Yet, like the city she lives in, there are hidden longings in her, propriety the rule, not cure, for what ails her. She cares more for her bedridden grandmother and cats than overbearing aunt, keeping house and tending to a small garden, painting flowers and waxing poetic in her journal. At first, she in awe of and certain she will have little to do with Stradella. Slowly, his ego, playfulness, need of a copyist and camouflage involve her in an inspired and insidious world, exciting and heartbreaking as she is enlarged by his magnanimity and reduced by his missteps, forging a friendship that challenges how far she will go. It was a Sunday morning when she tried to return the folder with the copy included. Golone wouldn’t have it, leaving the house in a hurry. She might take advantage of Nubesta’s day off, as well, if Signor Stradella returned directly from whatever service his music attended while Despina napped after going to mass. Donatella trailed her aunt down small streets and across the square named for the closest church open to her faith even when she had none. For once she wished she wasn’t late. Santa Maria Maddalena was filled with music as sacred as its interior; a modest congregation settling amid its garlanded pillars and gilded moldings, nearer to heaven anticipated in the ceiling of the main altar. Her aunt looked for her to slide into their usual pew but Donatella’s skirt didn’t completely leave the aisle and she ignored a whispered objection more adamant as heads turned, putting herself forward as she never did except for communion. It wasn’t her intention to be seen reverent in the ritual of silk and linen vestments and covers, golden chalice, paten and tall tapers, or kneeling nearer the graceful pain of the crucifixion, to be overheard less than fluent in echoes of Latin. She sat back and it was obvious why she was there: not for the usual madrigalists shielding the altar and taking direction from the pulpit, but an almost heretical performance in the small gilded gallery to her left, a stone rolled away, resurrection in the pleasured expression of strings and a man to whom every passion was necessary. It wasn’t the place for bows except in prayer. Signor Stradella’s attention soon moved to the young lady by his side who had sung with sweetness, not strength. On the way home one of the better houses was inviting. Despina sent her niece on, Donatella only minding the weight of her veil and skirt in the May shower that wasn’t unexpected either. By the time she hurried across the via Luccoli to face Saint George and the courage she lacked, the pavement was steaming and her resolve changing as quickly as the weather. Signor Stradella pushed the gate for her to go first, his rain-scented shrewdness surrounding her as he opened the front door. “Ah. We have a secret.” He slid his violin case from under his coat. At least they weren’t alone in the house, Cook singing without Despina there to mind, and Nonna calling. He tapped Donatella’s arm and asked how the assignment was coming along. Besides the folder of music, Donatella carried up a tray of limonata and anise cake, another of Nonna’s suggestions. I am a native of Western New York State, where I currently reside. My writing life began as a child retreating into the stories and poems that came to me. Early on I developed an interest in history, especially European history, while myparticipation in and appreciation of music was encouraged through memories shared about my maternal grandmother, who was a concert pianist in Chicago in the 1920’s. Some of the most defining years of my adult life were while she was studying and living in rural England, in a yellow-stoned village with thatched cottages, a duck pond, and twelfth century church and abbey turned Jacobean manor house. In addition to writing, music, art, and cats, I am passionate about nurturing nature and a consciousness for a more compassionate, inclusive, and peaceful world. A House Near Luccoli is my first published novel. 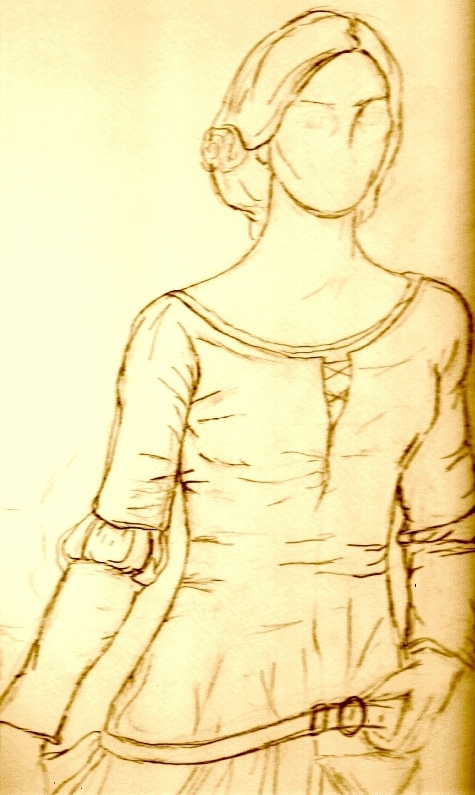 I am currently working on a sequel set in late Restoration England, and have also published an illustrated poetry book, A Friendship with Flowers. 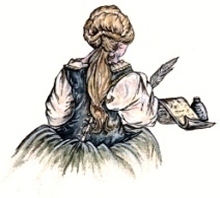 I recently did an interview with Unusual Historicals about the the writing of A House Near Luccoli and more. 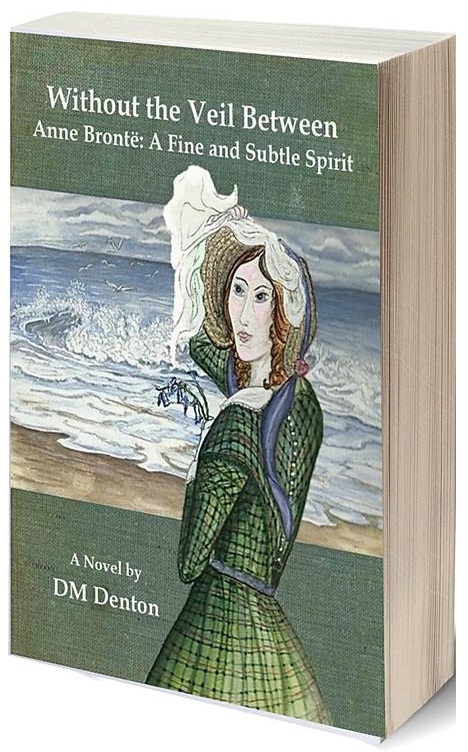 I also invite you to visit my website: http://www.dmdenton-author-artist.com, where you can find more information on my publications, view her prose and poetry portfolio and artwork. Thank you to Francine Howarth for hosting this virtual book fair. 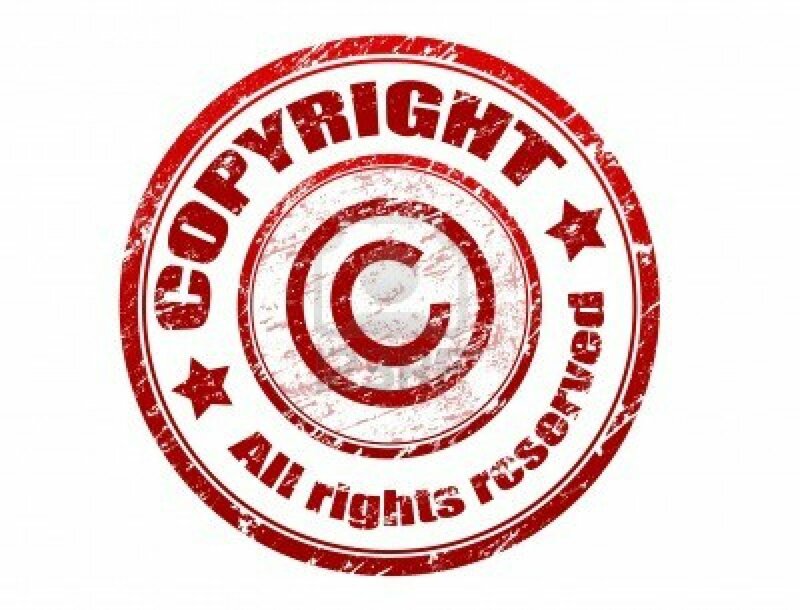 where you will find links to the sites of all the other authors who are participating. Have fun browsing the fair! Another post from me in record time! But I offer something I hope you will enjoy, including the chance for a giveaway copy of my novel, A House Near Luccoli! 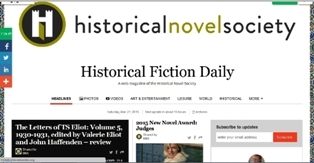 Today, Unusual Historicals features an interview with me regarding the novel and more. Thanks to Lauren Scott, Christine Moran, Ina Schroders-Zeeders, Kim Zollman Rendfeld, Angela Nevitt, and M.M. Bennett for their excellent questions. Drawn from among them, the winner of a free Kindle or NOOK Book copy of the novel is M.M. Bennett! There’s another opportunity to win a free copy (in whatever format – Paperback, Kindle or NOOK Book edition – that works best for you). But you must visit Unusual Historicals and leave a comment (brief or otherwise) on the post containing my interview (remember, e-books can be given as gifts!). While you are there, check out other guest author posts. It’s a great site! 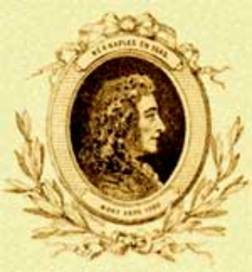 When and how were you first introduced to Alessandro Stradella? I first heard Stradella’s story and—knowingly—his music while driving to work in 2002 and listening to a Canadian classical music radio station show called In the Shadows. By the time I arrived at work, I could only remember his first name! Don’t tell my former boss but as soon as my computer booted up I Googled composers named Alessandro, scrolling down all the entries for Scarlatti to finally find a few mentions of … Alessandro … Stradella! In time I found out why Stradella—a celebrity in his time who produced a body of work that set him alongside the greatest Baroque masters—was, at best, a footnote in music history. Unfortunately, in the decades and centuries after his death, Stradella’s alluring ‘story’ took on an almost exclusively cloak-and-dagger slant in novels and operas, eclipsing his importance as a composer until his music was rarely performed. Only recently, thanks to a dedicated biographer and cataloger and some enlightened musicians, has that begun to change. In fact, I just discovered that Stradella’s “Sonata in D Major for Trumpet and Strings” was included in the soundtrack for the movie, The Girl with the Dragon Tattoo. How did your interest in Alessandro Stradella grow to the point of wanting to write about him? From the first, I was drawn to him because of the contradiction between the discipline of his work and recklessness of his behavior. It evoked a special connection for me, for I had personally seen the potential of talent and purpose sabotaged by incautious, even self-destructive behavior. The more I learned about Stradella’s triumphs and failures, and all the hard work and missteps in-between, the more I became fascinated by a personality at once charming and creative, intelligent and indulgent, cultivated and itinerant—an adventurer who made a few messes but also many masterpieces along the way. Finally, in the summer of 2005, I really met Stradella in the intimacy my imagination created: observing him behind the scenes in great and small ways, surrendering to his charisma, and enjoying his self-determination while exploring why he so often put his career and life at risk. I often thought how much easier it would have been if there were more details available about his appearance, personality and the events of his life, but I also realized his obscurity offered an opportunity to discover him in less public ways: through his letters, even his handwriting, and especially his music that knew the ‘rules’ but pushed the boundaries. Is the house near Luccoli of the novel’s title an actual residence? There is the possibility that the last place Stradella lived in Genoa was a house near the Luccoli district. The house was most likely owned by Guiseppe Maria Garibaldi, one of the Genoese noblemen who supported Stradella. I couldn’t find any specific details regarding this house—such as its exact location or whether it still existed—but for the purpose of the novel put it on the map and set to ‘building it’ based on what my research and imagination came up with. I knew from the beginning that I wanted to create a domestic setting for the meeting and developing relationship between Donatella, my fictional female protagonist, and Stradella; one that allowed the reader behind the scenes of his career and persona. The novel does, at times, escape such close quarters into the magnificence and mayhem of Genoa; but, I think, essentially remains an interior study of character and circumstance. What surprised you the most in your research for the novel? One of the most surprising things was discovering Genoa as a fascinating place and perfect setting for the story I wanted to write. Up until then I knew it as Christopher Columbus’ birthplace, otherwise—if most travelogues of Italy were anything to go by—for passing through on the way to somewhere else or avoiding altogether. La Superba (The Superb One) is a vertical city, back-dropped by the Apennine Mountains, surrounding a bay looking out past its famous Lanterna (lighthouse) and the Ligurian Sea towards the eastern Mediterranean. It has splendid churches, palaces and villas; but, also, in its medieval center, a labyrinth of narrow caruggi (alleyways) full of poverty, danger and sudden beautiful entrances to half-hidden palazzi. It is a conflicted place with, as Stradella’s chief biographer, Carolyn Gianturco, wrote, “a climate of public puritanism and private crime.” The novel is about human contradictions, too: Stradella’s, of course, but also Donatella’s. Genoa has been called “the most English city in Italy”, and so proved an apt location as Donatella is a ‘daughter’ of both countries. Were you tempted to write yourself into any of the characters? I was more than tempted. I knew I was there from the opening lines, disguised and revealed in the character of Donatella. Like me, she is Italian and English, a writer and artist, gardener, companioned by cats, wrapped up in solitude, contradictions, moods, and memories, and addicted to music’s presence in her life. Certainly, I could understand her struggle with surrendering to Stradella’s charm, talent and impetuosity; how it felt to be amazed, flattered and bewildered by such an attraction; and that in the end so much and so little changed for her through knowing him. This was a very personal story for me to write. Even more so once it was published, life imitating art when Donatella’s quiet grief and onward journey became my reality, too. How did you write about music and are you a musician yourself? I knew the most important thing to do was listen—constantly listen, Stradella’s music a soundtrack to the conceptualizing, researching, and writing of the novel until I was living with and even haunted by it like an invisible presence. Of course, I did refer to academic sources, and the notes on CD sleeves were also a great help. I used some musical terminology as it offered imagery the poet in me found too lovely to resist! 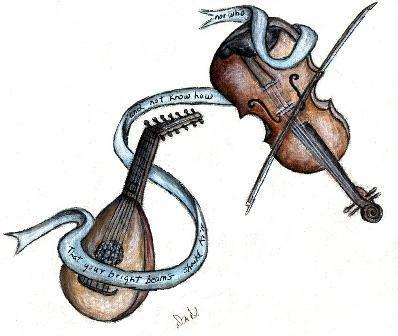 I have played the piano, guitar and Celtic harp, and sung a little. The pleasure I find in trying to translate music into words might come from my regret at not having pursued a musical career. I suppose writing about music is another way of participating in it. I found it very satisfying. I never set out to try to imitate, explain or even describe music, but somehow convey its elusive existence in the heart and spirit. This question makes me think of the 1991 French movie about the 17th century composers Marin Marais and Sainte-Colombe, Tous les Matin du Monde that asks: “What is music?” Sainte-Colombe insists words cannot describe it—that it is the sound of the wind, a painter’s brush, wine pouring into a cup, or just the tear on a cheek. I agree that it is impossible to express the essence or the effect of music in words, but I hope my readers experience something of its beauty and power through what I have written, especially as it is inexpressible. How long did it take you to find a publisher for the novel, and what are you currently working on? From completion to publication of A House Near Luccoli took about four years. Initially, I had submitted to literary agents for a year or so, but—perhaps sooner than I should have—gave up; except for creating a website which was eventually noticed by the novelist Mariana Julia Neary who was influential in my signing with All Things That Matter Press. My affiliation with this small publisher has proved to be one of the best things that has ever happened to me, not only because of their willingness to publish the novel, helping me to make it the best it could be while honoring its vision and voice even to the extent of using my own artwork and design for the cover; but also because of the dedication and ongoing patience and encouragement they extend to all their authors. I am currently working on a sequel to A House Near Luccoli which I hope to have completed by late spring or early summer. I continue to write poetry and small prose pieces accompanied by artwork for my blog, and have just published an illustrated poetry journal entitled, A Friendship with Flowers. A House Near Luccoli is available in Paperback and Kindle Edition at amazon.com and as a NOOK Book at barnesandnoble.com; soon to be an audio book. 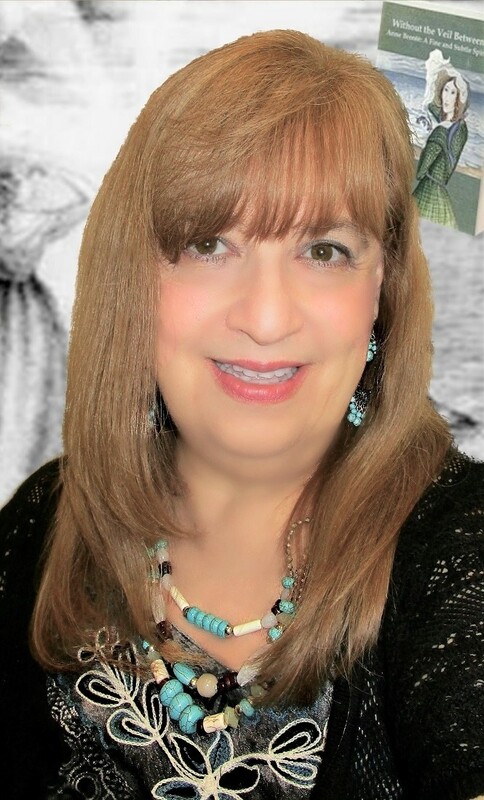 Diane invites you to visit her website: http://www.dmdenton-author-artist.com/, where you can find more information on her publications, view her prose and poetry portfolio and artwork. 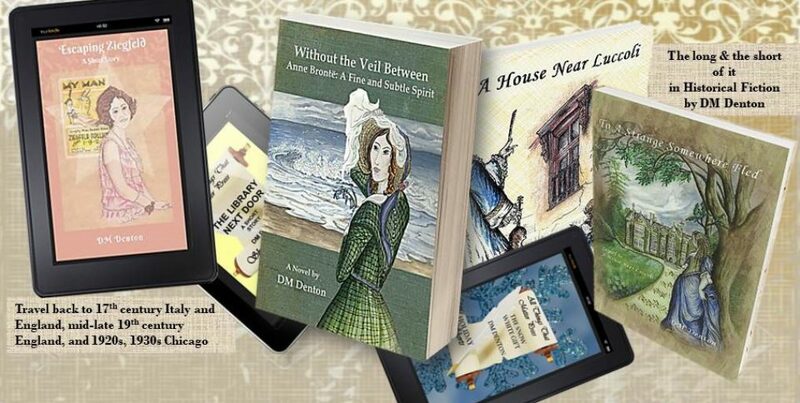 Thank you for taking the time to read and hope you have put your word in over at Unusual Historicals for the giveaway! and, maybe, so they won’t worry. 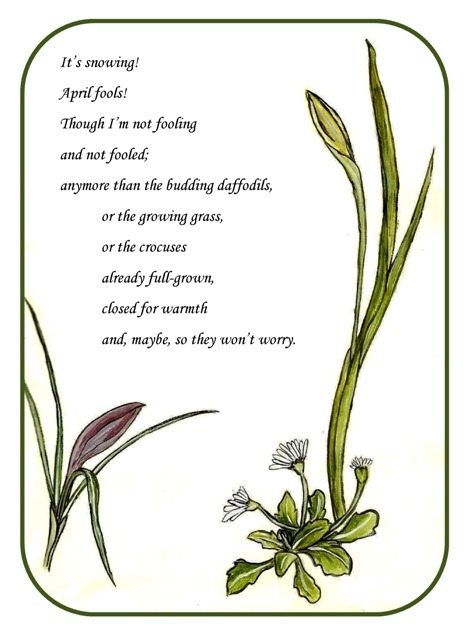 Writing note: I tell a lie – it isn’t snowing today, but it was April 1st, so posting a few days late. Actually, today is lovely: songbird sunny and pleasantly expectant. Hope it is for you, too.